The Samsung Galaxy Gio comes with the stock Froyo gallery. It has good functionality, cool 3D looks and nice transition effects, but unfortunately (again) only shows a downsized version of your images. The different albums appear as piles of photos which fall in neat grids once selected. If you have online albums over at Picasa those show up as separate stacks as well. Alternatively, you photos can be organized by date with the help of a button in the top right corner, which switches between grid and timeline view. Thanks to multi-touch support pinch zooming is also enabled on the Galaxy Gio but you can also double tap or use the +/- buttons. There are tons of options for a picture – you can crop or rotate it directly in the gallery. The Send feature offers quick sharing via Picasa, Email apps, Bluetooth or MMS. The player on the Samsung Galaxy Gio can handle 3GP and MP4 video files. DivX/XviD support is missing, but at least we had no problems playing videos at up to WVGA resolution. 720p videos wouldn’t play, but that’s overkill on a HVGA display anyway. But you’re not limited to the Galaxy Gio display. Thanks to DLNA you can view photos and videos on compatible hardware – like TVs or computers with the right software (the latest version of Windows Media player for example). The video player interface itself is as simple and as it could possibly be – there almost isn’t one. You can use the Gallery or the My Files app to browse videos. The on-screen controls boil down to play/pause and skip buttons as well as a scrollable progress bar. The Samsung Galaxy Gio has the TouchWiz music player. The sorting options are displayed in a tabbed interface: current playlist, all tracks, playlists and albums, artists and composers. You are free to remove some of the filters to make the interface easier to navigate. In addition, Samsung have enabled equalizer presets on the Galaxy Gio along with DNSe. The great feature that allows you to quickly look up a song on YouTube or via Google search is also available. The handset also prompts you to select whether to look up the artist, the song title or the album. What’s even better, the YouTube search results are loaded straight into the YouTube client. The thing missing is the fancy Disc View from the Galaxy S lineup. The Samsung Galaxy Gio is equipped with an FM radio with RDS. The interface is simple – there’s a tuning dial and you can save as many as 4 stations as favorites. You can also play on the loudspeaker, but the headset still needs to be plugged in to act as an antenna. 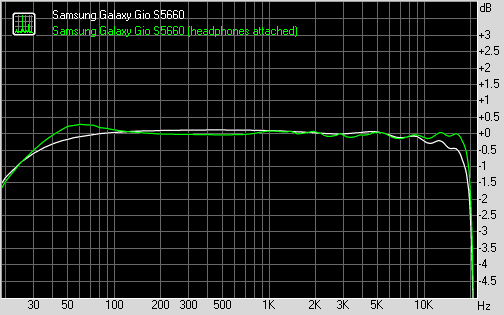 Samsung Galaxy Gio S5660 did pretty well in our traditional audio output quality test. The smartphone is pretty impressive when used with an active external amplifier and even if you plug in a pair of headphones, things don't turn too ugly. This is ceratinly a performance better than expected given the modest price tag. An active external amplifier lets the Galaxy Gio show its full potential and achieve great scores all over. The smartphone is also pleasingly loud, so there's nothing to frown at, really. Unfortunately, the degradation when headphones come into play is major. Volume levels take a hit, but it's stereo crosstalk that suffers the worst. Intermodulation distortion is affected too, though not quite so significantly.